Today many surgical eye care procedures are performed under local anesthetic on an outpatient basis. But even though eye surgery is nothing like it was a few decades ago, it’s still important for patients to follow their eye surgeons’ aftercare instructions to the letter. It can make the difference between a speedy recovery and painful post-operative complications. We asked the doctors at Florida Eye Specialist & Cataract Institute for their tips to help hasten your recovery after surgical eye care. Don’t read, watch TV, or use the computer for the first 24 hours after your surgery. Your eyes have only begun to heal at this point, so you should do everything you can to avoid straining them for at least one day afterward. If you have to go outside, wear UV-blocking sunglasses. It’s important to protect your eyes from the sun anytime you go outside, but it’s doubly important while you’re recovering from surgery. Keep your eyes lubricated with artificial tears. This helps hasten the healing process and makes you feel more comfortable. Your doctor will advise you about use. It may be tempting, especially if you’re tired or your eyes feel itchy, but rubbing can reopen incisions, leaving your eyes vulnerable to infection. Wear any protective eyewear given to you by your doctor during your recovery. After surgery, your doctor may have sent you home with protective eyewear for the shower or even for sleeping. Using this eyewear as instructed will help reduce your risk of eye injury and infection. Protect your eyes in the bath or shower. Shield your eyes from running water while they heal and also take care to protect them from shampoo and conditioner, which can irritate incisions and cause pain and inflammation. Avoid public pools, hot tubs, and saunas during your recovery. These environments can be unhygienic and increase your risk of developing a post-operative infection. Don’t wear eye makeup during your recovery. Mascara wands, eye shadow palettes, and eyeliner pencils can hold bacteria, and be transferred into your still-healing eyes. Help minimize your risk of infection by allowing your eyes to fully heal before applying cosmetics. Avoid exercise and contact sports until you’ve fully recovered, and always wear proper eye protection afterward. Exercise can increase intraocular pressure which can set back your recovery, so take it easy until your eyes have healed. Once you resume your usual fitness regimen, make sure to wear protective goggles to protect your eyes from trauma. Avoid dusty and dirty environments during your recovery. Fine particulate matter in the air can irritate your eyes, causing pain and increasing your possibility of infection. For that reason, you should stay out of wood shops, garages, construction sites, basements, and other locations where you might come into contact with dirt, dust, or sawdust during your recovery period. Also, be aware that some of the big box home improvement stores like Home Depot and Lowe’s may also have higher levels of particulates. If your vision worsens, call your doctor immediately. After surgery, you’re likely to notice that your vision has improved. But if you observe any negative vision changes (blurriness, shadows in your field of vision, floaters, loss of peripheral vision, etc.) notify your doctor right away, as these may be signs of complications. If you are having symptoms of infection, call your doctor immediately. If you follow your surgical aftercare instructions, you should have a smooth and uneventful recovery. But if you begin experiencing eye pain, inflammation, redness, abnormal discharge, or other signs of infection, contact your doctor right away. Even mild infections can worsen and jeopardize your eye health, so early intervention is vital. Make sure to attend your follow-up appointments. If your recovery goes off without a hitch, you may think you don’t need to follow up with your doctor. 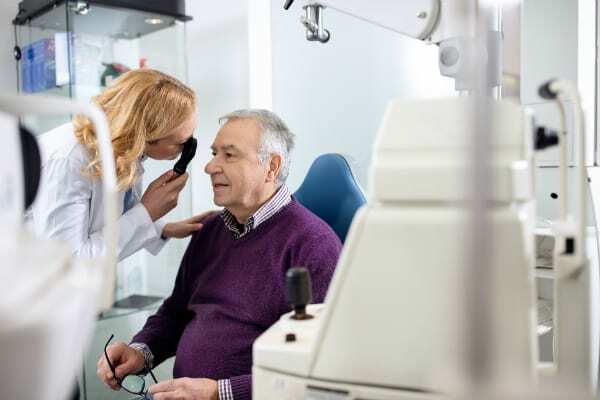 But your follow-up appointment is an opportunity for your doctor to check your eyes for possible complications you may be unaware of (especially those inside your eyes) and verify that your healing is proceeding the way it should. It’s a good safeguard against possible complications so don’t skip it. The above article was for information purposes only and should not be considered an adequate substitute for professional eye care. If you have any questions or wish to schedule an exam, please contact us at Florida Eye Specialist & Cataract Institute. We look forward to hearing from you!